Nigeria on Tuesday declared a Lassa Fever outbreak in the country. This followed the increase in the number of Lassa Fever cases reported in states since the beginning of the year, the Nigeria Centre for Disease Control said. This is coming on the heels of the Lassa Fever International Conference held in Abuja to mark 50th year anniversary of the discovery of the disease in the country. Each year, Lassa Fever kills many and leaves most of its survivors with disability, often due to the side effects of the drugs they received. The viral disease is contracted from the feaces of the multimammate rat and often transmitted via human to human contact. NCDC in a press statement released on Tuesday said there has been an increase in the number of Lassa Fever cases reported from many states across the country since the beginning of the year. "As at January 13, a total of 60 confirmed cases have been reported in eight states," NCDC said. The national EOC includes representatives from the World Health Organization (WHO), Federal Ministry of Agriculture and Rural Development, Federal Ministry of Environment, US Centers for Disease Control, as well as other partners. The centre said in preparation for this year's emergency phase, the agency has been providing support to states including the provision of emergency supplies and deployment of Rapid Response Teams (RRT). "The RRTs will work with states in response coordination, contact tracing, case management, risk communication and strengthening infection prevention and control practices," it stated. This, they said, has been going on since 2018 when Nigeria experienced the largest reported case of the outbreak since the history of the disease in the country. In 2018, a total of 3,498 suspected cases were reported from 23 states. Of these, 633 were confirmed positive, 20 probable and 2853 negative (not a case). Also in 2018, 171 deaths among the confirmed cases and 20 probable cases were reported making the case fatality rate in confirmed cases as high as 27 per cent. Though the disease is more prevalent in Edo, Ondo and Ebonyi states, 20 other states recorded at least one confirmed case across 93 LGAs. They are Edo, Ondo, Bauchi, Nasarawa, Ebonyi, Anambra, Benue, Kogi, Imo, Plateau, Lagos, Taraba, Delta, Osun, Rivers, FCT, Gombe, Ekiti, Kaduna, Abia, Adamawa, Enugu and Kano. "Since the Lassa fever outbreak in 2018, NCDC has worked with states to ensure better preparedness and improved response. In the last one year, guidelines have been revised, new data management tools have been developed and the laboratory network has been strengthened. Additionally, risk communications has been strengthened through radio, posters, flyers and social media," it said. "A national research plan has been developed, to enable its full integration into the outbreak response to gain a better understanding of the disease", NCDC said. A good development that came out from the 2018 outbreak was that researchers were able to improve on the diagnosis of Lassa Fever in the country. Before then, Nigeria had struggled with the diagnosis of the disease as most of the samples were usually sent out of the country. But as of today, Nigeria now has four laboratories where Lassa Fever can be quickly diagnosed without much ado. Lassa Fever is an acute viral haemorrhagic illness, transmitted to humans through contact with food or household items contaminated by infected rodents. Person-to-person transmission can also occur, particularly in hospital environment in the absence of adequate infection control measures. Health care workers in health facilities are particularly at risk of contracting the disease, especially where infection prevention and control procedures are not strictly adhered to. NCDC has advised members of the public to focus on prevention by practicing good personal hygiene and proper environmental sanitation. Hand washing should be practiced frequently. The public is also advised to avoid bush burning. 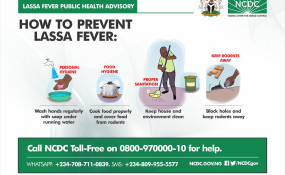 The disease control agency also reminded health workers that Lassa Fever presents initially like any other disease causing febrile illness such as malaria; and are advised to practice standard precautions at all times, and to maintain a high index of suspicion. Rapid Diagnostic Test (RDT) must be applied to all suspected cases of malaria, it said. When the RDT is negative, other causes of febrile illness including Lassa Fever should be considered. Accurate diagnosis and prompt treatment increases the chances of survival. The national guidelines for Infection Prevention and Control, as well as Lassa Fever case management have been developed, and disseminated to states. NCDC has pledged to remain committed to supporting all states' public health teams to prevent and respond to public health threats.